Mobilia Gallery, Cambridge, MA on a sunny spring day in April. A group of Boston MFA curators and textiles lovers converge on this gallery. Artist Hanne Behrens has flown in from Denmark to share her artwork. It was a love affair in the making. Woven metal! Yes, a Hanne is a goldsmith that has practiced her craft for years. She has created textiles out of metal. Here is a picture of how it is done. 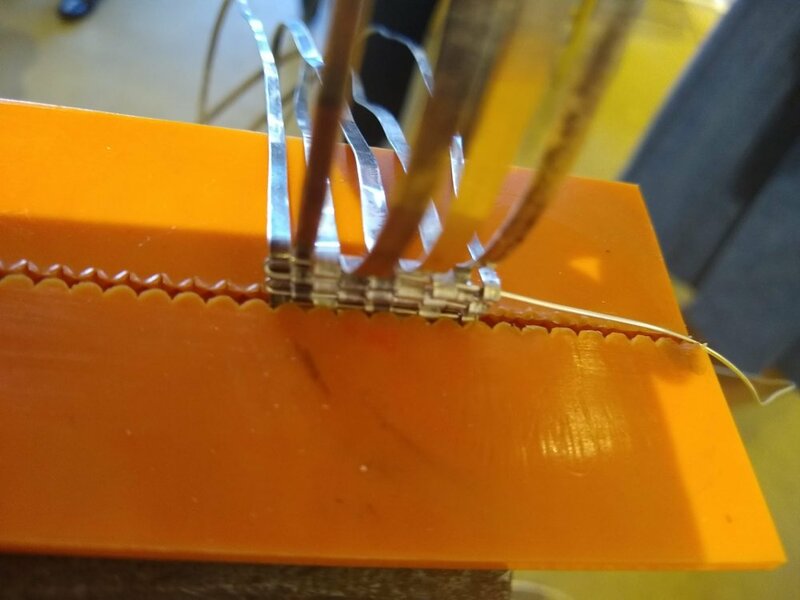 Held in a vice, the metal is folded over left to fight (every other) and a cylindrical piece of metal is then threaded through. The textile metal then comes out in a long straight piece that Hanne molds into different shapes. The artistry and jewelry is beyond imaginably beautiful. Hanne’s passion for her work is evident. She is continuously challenging herself with new methods and creations. Her newest method is knitting metal. The colors are bold and striking. Working form her farm in Denmark, Hanne quest is to pass on her techniques. She currently has an apprentice working with her two days a week. Hanne’s next goal is to write a book that outlines her methods and ideas. Thank you Hanne for sharing your passion. It was amazing to meet you! Yes, that is an original pin Hanne created and is wearing. Woven gold and a found shell from Spain! Hanne’s collection at Mobilia Gallery of both woven and knit designs in earrings and pins. 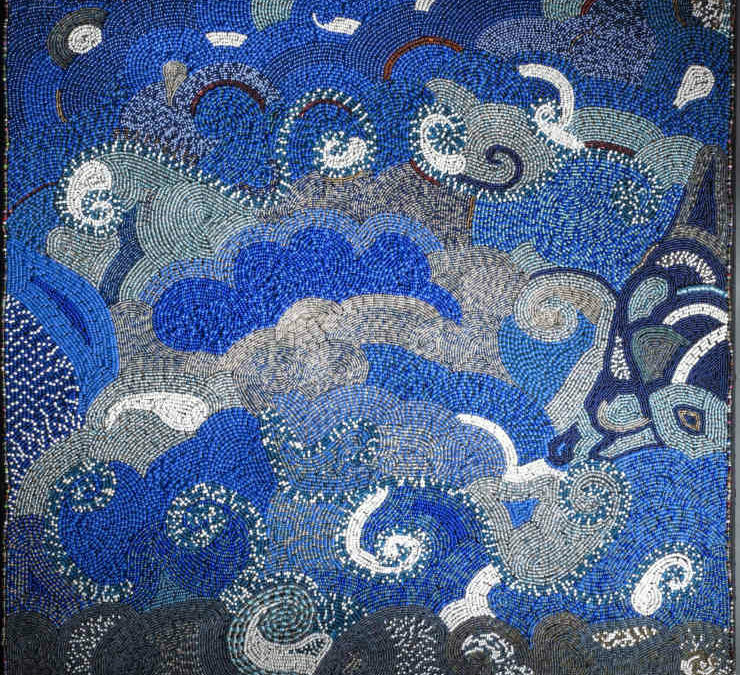 Thousands of glass beads + fabric + amazingly talented women=Ubuhle women art work from South Africa. These women use beads in place of a paint brush. Most art pieces take an average of one year to make. The word “Ubuhle” means shimmering beauty. A step into the new exhibit at the Currier Museum of Art in Manchester, NH and I was surrounded by the shimmering beauty and the beautiful souls of the artists behind the art work. Each piece has a truly unique style and celebrates life and the challenges that come with life. Some women are widows and others have friends and family members that have been lost to HIV/Aids. In order to survive and provide for their families this family of artists was developed. The women and children all live together on a farm and use the traditional beadwork their ancestors passed down adapting it to create the “canvas” panels. 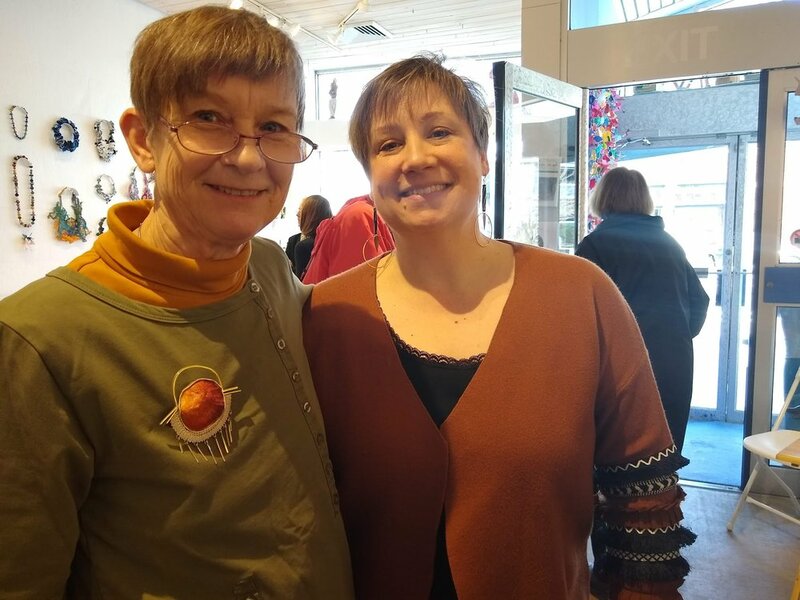 The empowerment of the women living in this community, with their leader Bev Gibson, was the resounding voice I heard and keep hearing after walking away from this exhibition. I felt an overwhelming sense of exuberance for the South African women. Although life may be difficult, art has helped them overcome so many situations. There is a sense of gratitude that the women share. This is a take away after seeing the exhibit. Fabric, beads and love are a powerful combination. The back of the beaded fabric canvas. Thank you to the Smithsonian Anacostia Community Museum for creating the exhibit and placing the works on display and an organized tour. I have thought of stepping on the moon, but never thought I would make it through the low gravity training. Thankfully I found a way to visit the moon without any physical prep. Whew! Moon fabric out of Yorkshire, England, a mill that creates amazing wool fabrics and products for clients, was started in 1835. Can you believe it! They now have a collection of 36 looms, four additions and started furnishing the home dec market only 12 years ago. Moon is the biggest employer in West Yorkshire. Employing over 220 people in the small town. It’s specialty is plaid. Yes plaid! My favorite fabric. They fabricate their textiles using wool from New Zealand and South Africa. The Shetland wool is from New Zealand and the Merino wool originates in South Africa. 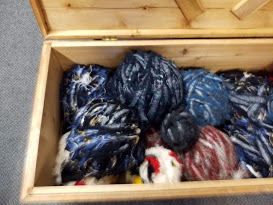 I learned that the warmer the country where the sheep live, the finer the wool and that the smaller wool fibers create a softer wool. Moon has changed business styles over the years, first manufacturing their own fabrics, then providing coop space to local weavers, producing only military fabric during WWI and WWII and then fabrics for fashion houses prior to the addition of home dec fabrics. Color-oh my! The colors of Moon wool are amazing. Contemporary colors for some clientele and a Heritage collection for more refined tastes. Although the weaving process is defined by a numerous amount of steps. the end product is out of this world gorgeous! I may not have physically stepped foot on the Moon, but the introduction to Abraham Moon, the founder of the textile mill, and the textiles that the mill still creates has taken me on a out of this world adventure. More on the weaving at Portfiber in Portland. I learned and wove at the same time. The terms shuttle, mostly used to describe when packing a car with loads of teenagers and taking them from one place to another, is also used for the tool that takes the wool from one side of the loom to the other. The wooden shuttle had less drama but did produce enthusiastic participants. Color choices for the rug inspired the final design. Given that Portland is on the seashore, blues were the immediate choice. Left, right, left, right…..progress! Laughs and a few mistakes. All part of the learning process. How long could the fun last? All day! Learning to pass the filled shuttle with just the right force so it would get all the way through the loom but not half way across the room seemed like it should have been easy. Well not for this girl. I was never good at sports…who knew that sports skills would transfer to weaving? I made it through without causing too much damage to the workshop. I may be asked for a damage deposit on a second visit. The fun did have to end at some point. The loom was low on warp threads. 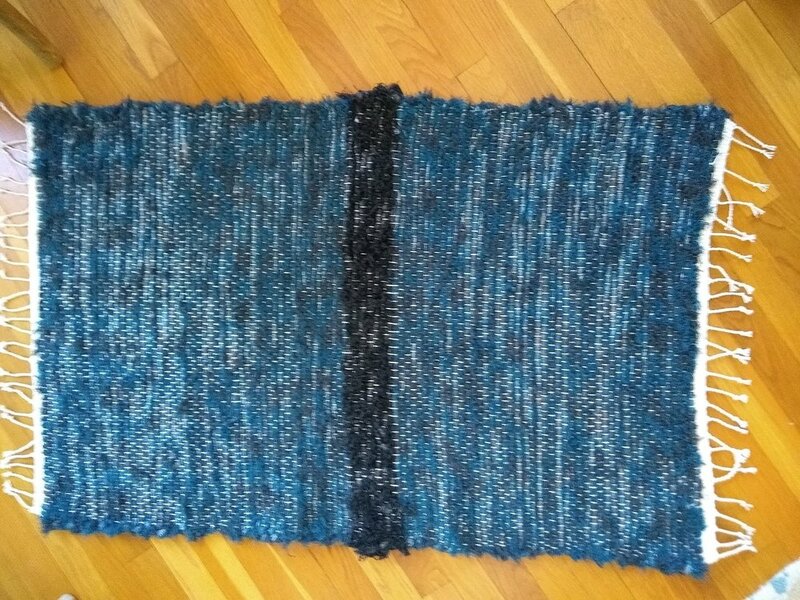 After only four hours of weaving the rug was complete. Record time! Next time I will bring a stop watch to see if I can increase my speed. I hear that is what athletes try to do as they practice. After cutting the warp thread and the rug off the loom…yikes in so many ways….and fancy tying on each end of the rug it was finished. Now all that was left to do was admire. And here we have the finished rug….you be the judge of the results. I say not bad for a newbie. I can’t wait for the next adventure! Hand dyed wool ready to be spun. A rainbow of options. Why did I travel to Portland? Well, I did this to work a loom and hand weave a rug in one day. Yes, that’s right a rug made of Pendleton wool salvages. Fortunately the loom was pre strung so all I had to do was hop up onto the bench seat and use the pedals like a piano player to move the warp yarns up and down. I managed this despite not being able to touch the floor! I even took my shoes off to feel the pedals like a true weaver. I think observers would know my novice ability level in no time. Having way too much fun with Renee Rucci of Renee Rucci Design. I am holding a shuttle to weave the weft threads through. Despite this, after only a few hours I was gratified at seeing the beginnings of a rug. The hues of blacks and blues were looking perfect. This gave me encouragement to continue with the help of my fellow novice weaver, Renee. A few pointers came from the instructors along the way. It may have been our commentary on our progress or the laughter emanating from our side of the room that would clue them in to when we would need a rescue and help with our technique. I have to say that this day at Portfiber gave me a sense of accomplishment and new appreciation for weavers and their craft. 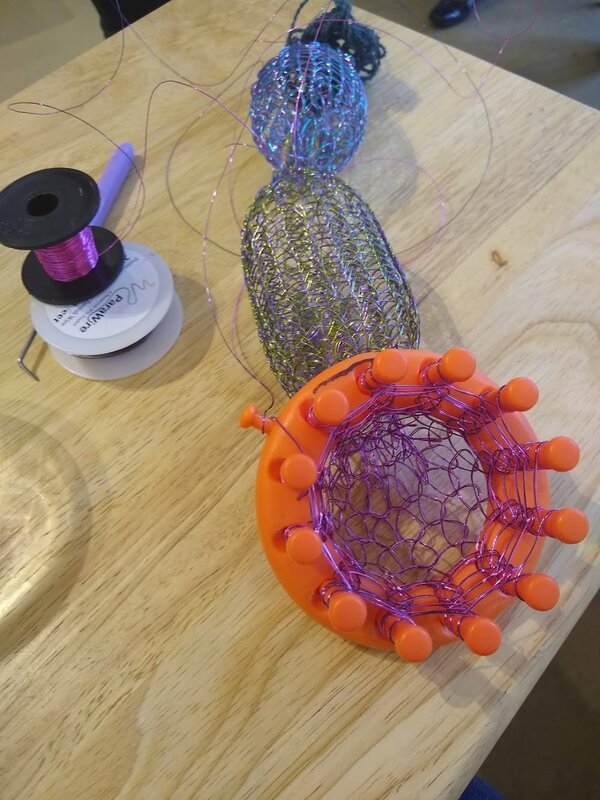 See if you can resist checking out the portfiber.com website and take a make a visit the fiber arts studio and try your hand at weaving. Sarah Lincoln, does that last name sound familiar? It should she was a cousin of Abraham. Several of her linens were donated to the Hingham Historical Society. These linens date back to 1815. The collection holds bed linens, pillow cases and towels. Bed linens were made of flat sheets. (No fitted sheets then-made for easier folding). Each sheet has hemming at the top and bottom, but the selvages were left in tact and used in replacement of side hems. 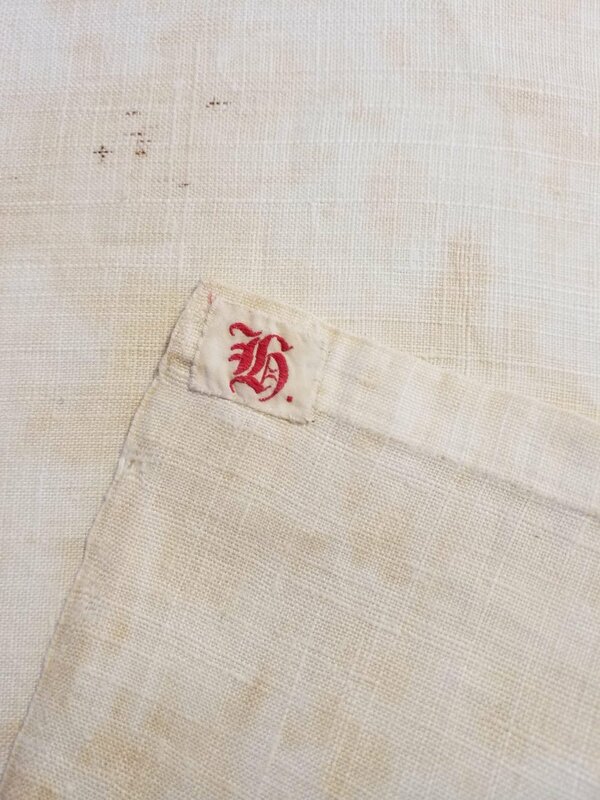 The sheets also have a small “H” tag sewn to the corner. There is debate as to what the letter means. Could it mean Hingham or if it is turned over it does resemble and “L” which could stand for the Lincoln last name. Another familiar name is Hancock. 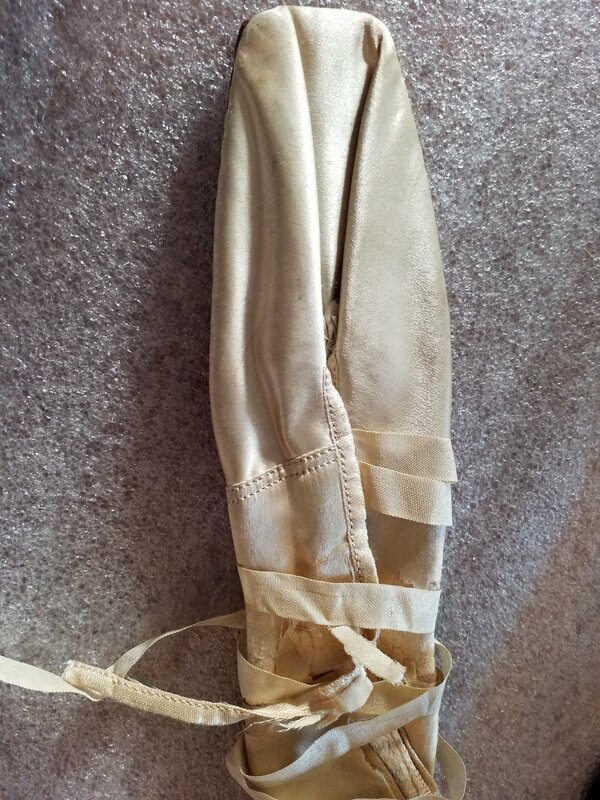 I was able to see the wedding socks of Dorothy Quincy Hancock that she used on her wedding to John Hancock. These socks had been passed down in the family to each new bride. The bride wore the socks on their wedding day and then passed them onto another bride. The socks were of white silk with beautiful cut lace work. Only a tiny mend at the toe. A piece of her dress lives with the socks. Her dress was green with a gold brocade pattern. I am sure she looked stunning. Before leaving the historical society, I asked Michael if he had a favorite piece in the collection. He responded by mentioning swords that were used in the Battle of Yorktown, a Civil War medical case and portraits of Hingham residents that were cut and shot at because the residents themselves had already gone into hiding prior to the British search. He could not pin down one article, he enjoys the artifacts and most importantly the stories that come with them. Quilts, quilts and more quilts. The Hingham Historical Society has an endless collection of quilts. The are very fortunate to own several abolitionist movement quilts. Marches were held in Hingham to protest the use of slaves and Hingham was very active. Abolitionists would also meet in Hingham in secret at a place called “Tranquility Grove” to discuss the movement and steps that the members wanted to take to protest. The quilts I viewed had muslin backing and very little batting if any between its front and back layers. It did have a tremendous amount of hand stitching! One quilt made by Mary Hersey Lincoln of Hingham was made specifically for and anti-slavery fair held in Boston in 1840. The quilt was constructed of blue and white cotton squares approximately four by four inches. The white blocks have statements inked onto the cloth. One statement is, “Sleep, baby, sleep, and angels watch thy rest. No dream of ill molest thee.” Nothing like our protest banners made from paper today. Thank goodness these people had the courage to march and call attention to the changes that needed to be made. It seems to be a continuing need for acceptance here in the US. May we use their strength to teach and behave with tolerance. The first piece I pulled after getting lost in the closet for a good hour was a mourning skirt. Black silk with ribbon embellishments. Hand stitching galore!!! It was well in tact with a petty coat attached. 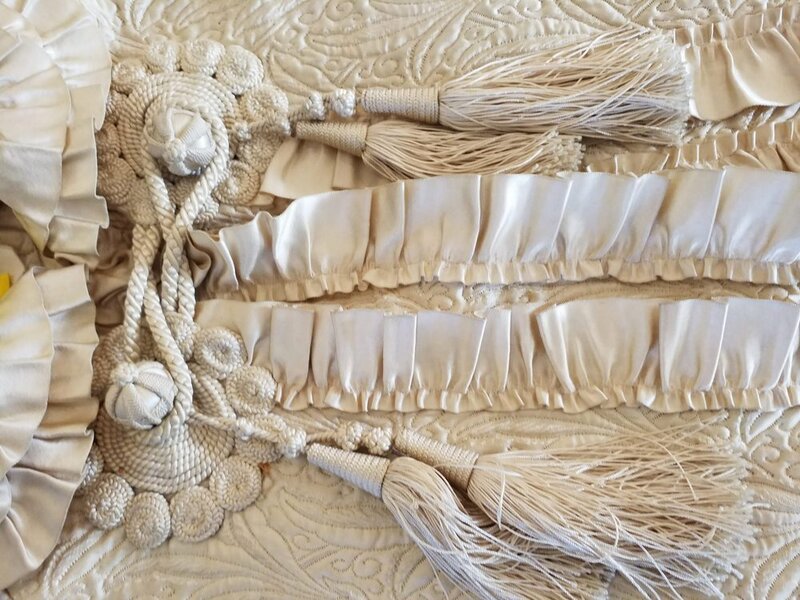 Two rows of ribbon delicately folded to create an intricate embellishment with a time taking scallop edge that had a tape sewn across the bottom. To die for. I think I may have tried to try it on, but I kept my self in check and drooled at all the hand stitching and imagined the history and “fly on the wall” moments this garment witnessed. The second garment was a cape dated 1815. Some one took great care with this possession. Hand quilted with embellishments everywhere. Hand shirred ribbon and a tassel closer that made a statement. I could envision myself in a horse and buggy going to church services and having this cape to keep me warm and fashionable. 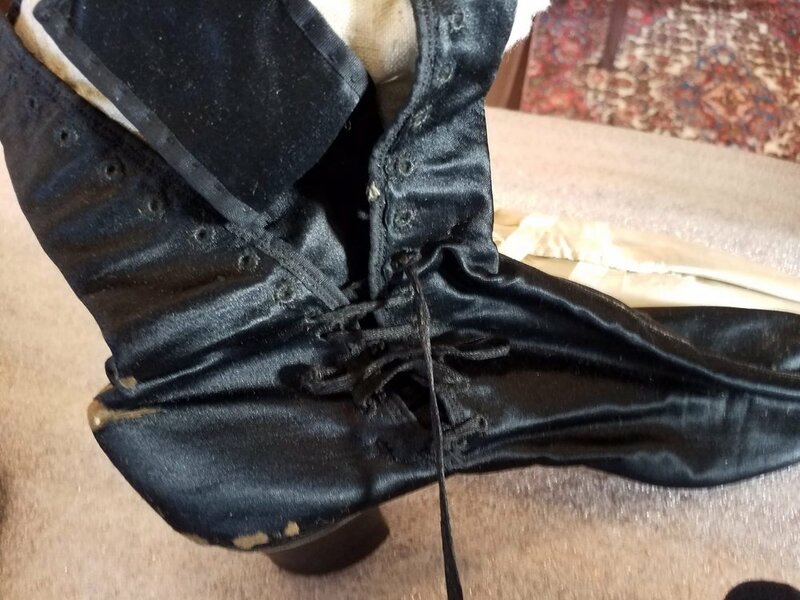 Another rare find was a pair of black satin shoes. The owners name was inked on the inside. Helen C. Lough, 1860. A small heal with approximately fourteen button holes to lace through. The button holes were finished by hand tacking. They are a work of art in themselves. Imagine the patience needed to lace up those shoes. Arch support was unheard of and the shoes are very narrow. Centuries of dealing with pain to be fashionable. Although a shoe factory did exist in Hingham, it is not known if the shoes come from the local factory, but their owner was a Hingham resident. Also, part of the collection is a Civil War coat sack coat worn by Hingham resident Luring Hersey Cushing. It features a wool lining and period buttons. Luring came back from the Civil War and made toys for children that are also on exhibit in the galleries. More news of goodies I saw in Hngham next week! Have you ever wanted to play in a closet with items from the 1800’s???? Well I did just that! Where you ask? 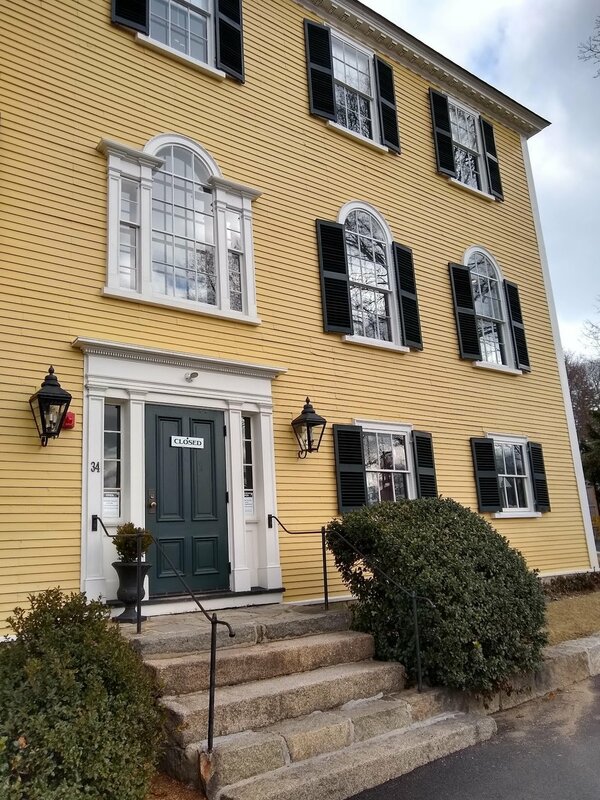 I traveled to the Hingham Historical Society in Hingham, MA for my adventure. Michael Achille, the Collections Manager and Registrar for the society was generous and allowed me into the newly built addition that now stores all the textiles the society has acquired. The collection focuses on Hingham and historical pieces that have a provenance from Hingham. The collection began in 1950 and the society acquired most of the textiles up until 1970. Most numerous in the collection are quilts that are kept in dark storage. (Sounds like you need a key and a special password to enter the dark storage area!) The dark storage also contains historical documents and some artifacts. Many of the society’s possessions are donations. Some come from families that have ancestors from Hingham, other items come from people that are renovating a home and open up a wall to find things hidden behind it. Now that would be something! A walk through the dark storage brought me closer to people like Sarah Lincoln and Dorothy Quincy Hancock. Amazing! I encourage you to take time to visit the Hingham Historical Society. The staff has a vast knowledge of the collection and love to tell the stories behind the items they exhibit. I will be writing about my finds in the next few blog posts. Stay tuned!